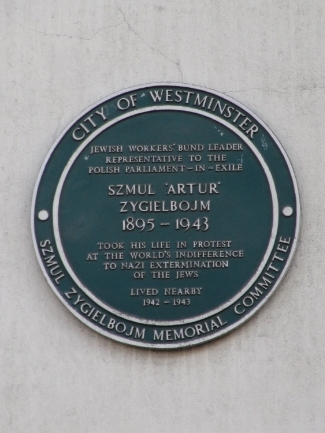 Szmul Zygielbojm was a Jewish socialist politician who was a member of the Polish government-in-exile, which was based in London. He had played a leading role in trying to make western governments and the public opinion aware of the Holocaust when detailed reports emerged from Poland in 1942. However, he grew frustrated with what he saw as the indifference of the Allies. On 12 May 1943, during the last days of the Warsaw Ghetto Uprising, he committed suicide in London, leaving this note. The latest news from the homeland makes it clear beyond any doubt that the Germans are murdering the last remnants of the Jews in Poland with wholly unbridled cruelty. Behind the walls of the ghetto the last act of this unprecedented tragedy is currently taking place. I cannot be silent and I cannot live while the remnants of Polish Jewry, whose representative I am, are being murdered. My comrades in the Warsaw Ghetto fell with arms in their hands in the last heroic battle. I was not able to fall like them, with them. But I belong with them, to their mass graves. My life belongs to the Jewish people of Poland, so I give it to them. It can be argued that the Allies were in no position to help the Jews of Warsaw in the spring of 1943. However, it is also true that there were politicians and civil servants in Britain and the USA who disbelieved the reports of the murder of Jews or who did not see it as a major priority.